The ringing in of a New Year brings a sense of hope for the future and closure of the past. It’s a time of reflection of past goals and habits and the ushering in of new, better behaviors. In the financial planning and investment world, it’s very much the same. Advisors, wealth managers and clients are looking back at what went right or wrong and determining the next actionable steps for the new year. Advisors and money managers should be doing this daily, but for most, unless you’re in the day-to-day dealings of the markets, this may be difficult. There is so much information out there, and the incessant talk of new highs can easily cloud one’s judgement. As we’re meeting with clients and updating financial plans, a big part of assessing the prior year is looking at calendar year returns. “How did we do versus the market?” is one of the most common questions. BUT, is it the right question? I’d venture to say no unless your overall goal is to beat the market. For most, that’s not the case, and comparing your portfolio to the Dow is like comparing apples to bananas or oranges unless you’re only investing in a large cap blended portfolio. A hurdle rate is the minimum return you need for a successful financial plan. In the majority of our cases, many clients’ hurdle rates are far below the actual average rate of return they experience in their portfolios. However, it’s not the market’s rate of return nor should it be. You see, if you want the market’s rate of return, you must take the good with the bad unless you employ a buy/sell discipline. Most don’t have a strategy to exit the market, but we’ll save that for another time. When investing in an index fund you can’t get the actual index’s return with those pesky things called expense ratios or fees. We can’t forget there will also be times of prolonged poor performance. 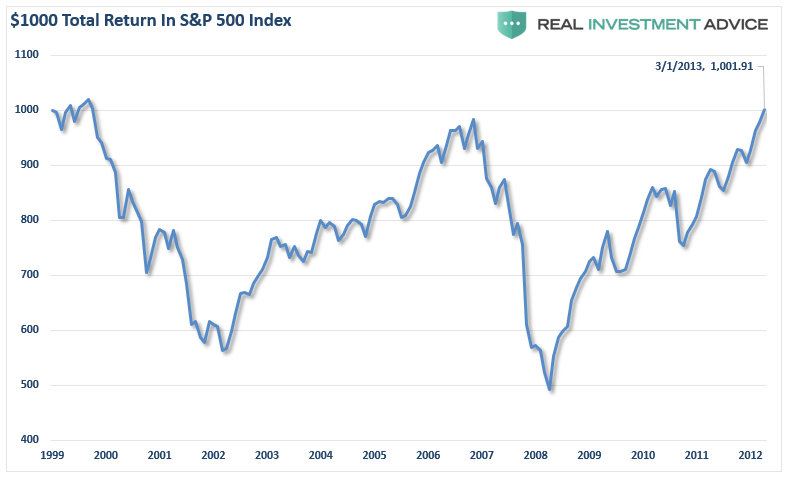 For example, if you invested in the S&P 500 from 2000-2010, it took you 10 years to get even, (we call it ‘the lost decade’.) You went in with $10,000 and you came out with $10,000. When markets are this fully valued, there is bound to be something bad in the future, meaning prior years’ returns have pulled returns from the future. Yes, there will be a reversion to the mean, but knowing your hurdle rate will allow you to rebalance or take risk off the table after having a good year. Hence, prepare for a rainy day. I think we can all agree that’s not a bad idea. When you’re determining your hurdle rate, there are many considerations to make. What type of sequence of returns are used? Is bad timing included, meaning what if you retire and the market drops the first two years? Does the plan inflate your expenses annually? What is the rate of return used? Sometimes advisors will make things look a lot better than they are simply to earn your business. That is not the way we conduct business, but it occurs. What type of risk can you handle? This is extremely important, but often glazed over with a “look at these long-term returns” says the broker. That’s great, but what if you retire right before or in the middle of a downturn? Can you push through and work longer? Will your company keep you around? Will your health hold up? Can you wait out the recession? The last big recession took many investors 4-6 years just to get back to even without considering any fees or distributions from your portfolio. What type of risk will not keep you up at night, but still give you the returns you need to maintain your lifestyle? Returns that “beat the market” sound great, but keeping more of your hard-earned money sounds even better. Did you answer an 8-question questionnaire on your market experience and your intestinal fortitude that are typically based on ‘recency bias’? Deep down you know yourself and the limits you can stand in the midst of turmoil, but a good financial plan shows what type of loss your wealth can withstand and still enable you to have a successful retirement. The higher the hurdle rate the less likely your plan will be successful—meaning, a major lifestyle change may be coming your way. Use realistic returns. (Yes, I’m talking to all of those 12 percenters out there, media pundits and planners who use those numbers). We revise our numbers annually based on market cycles and current valuations. Use variable rates of return; no one makes a flat 7% each year. Provide income tax alpha. We’re not CPAs, but we can help you determine the best way to take distributions to help you keep more of your funds. Make smart decisions regarding Social Security benefits and Medicare. Provide risk management that is not accounted for with financial planning software to portfolios. And no, it’s not with annuities or insurance products, it’s through having a very defined buy and sell discipline. Evaluate portfolios to ensure they aren’t built for the past, but prepared for the future. We have no crystal ball, but we can make very educated decisions by using fundamental and technical analysis and evaluating the current economic landscape. No portfolio should be built simply on the prior year returns. Unfortunately, this happens way more often than you might think. Use a realistic life expectancy. We have our clients go to www.livingto100.com. This gives us a better idea on life expectancy; we understand everyone doesn’t live to 103. Look at long term care and insurance policies. Many of the couples I meet with are self-insured. It’s usually the wife I’m most concerned with as it’s likely she’ll outlive her spouse. Ensure client has an estate plan. It doesn’t have to be fancy or sophisticated, but it should always include a will, power of attorney and medical directives. These are just a few tips to help you evaluate your own financial plan. Numbers are everywhere these days. We know our credit score, social security number, checking account number, debit card pin and alarm code like the palm of our hands, but how many of you know your hurdle rate? I’d bet more of you know the Dow Jones return for 2017 than your minimum rate of return (hurdle rate.) Get acquainted with it, know it. It will change annually depending on markets, impacts of withdrawals and your overall life situation. Financial plans aren’t meant to be static, they’re as fluid as our lives. Things change quickly in our lives and so should your plan. Don’t let one thing bog you down. Ask your advisor for your hurdle rate, he or she should know it. Also, be sure to follow the 10 rules of the road above to ensure your family is getting the most out of your plan. A financial plan or investment strategy isn’t something to rush through or skimp over because it is only your financial security we’re talking about. Danny Ratliff, CFP®, ChFC® is the Senior Financial Advisor and Planner for Clarity Financial. He is also a contributing wrtier to the “Real Investment Advice” website. Feel free to EMAIL Danny with any questions or comments.